There are 3 Nameservers, ns2.yourdnshost.net, ns3.yourdnshost.net, and ns1.yourdnshost.net. American Registry For Internet Numbers (Virginia, Chantilly) is the location of the Apache/2 server. 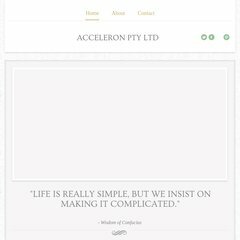 Acceleron.com.au's server IP number is 69.73.131.201. PING www. (69.73.131.201) 56(84) bytes of data. Website load time is 2037 milliseconds, less than 63% of other measured websites. As well, a ping to the server is timed at 48.2 ms.